Last week I enjoyed traveling to Santa Fe, the oldest capital city in the United States and a center of art, architecture, and literature. At an elevation of 7200 ft (2200 m), Santa Fe rises high above the desert floor at the southern edge of the massive Rocky Mountains. It presents an inspiring and scenic venue for the 20th annual Science-Writing Workshop, organized by renowned science writers Sandra Blakeslee and George Johnson. The workshop included a variety of friendly and encouraging instructors: Pam Belluck, a medical writer for the New York Times; Alan Boyle, science editor for NBC News Digital (whose group I was in), Adam Rogers, science writer and editor for Wired, and David Corcoran, editor emeritus for the NYT‘s Science Times. It also included a day at the Santa Fe Institute, an interdisciplinary research and education center founded by physicists (including the Nobel laureate Murray Gell-Mann), which hosts scientists and authors in a variety of disciplines, including Cormac McCarthy and playwright Sam Shepard. 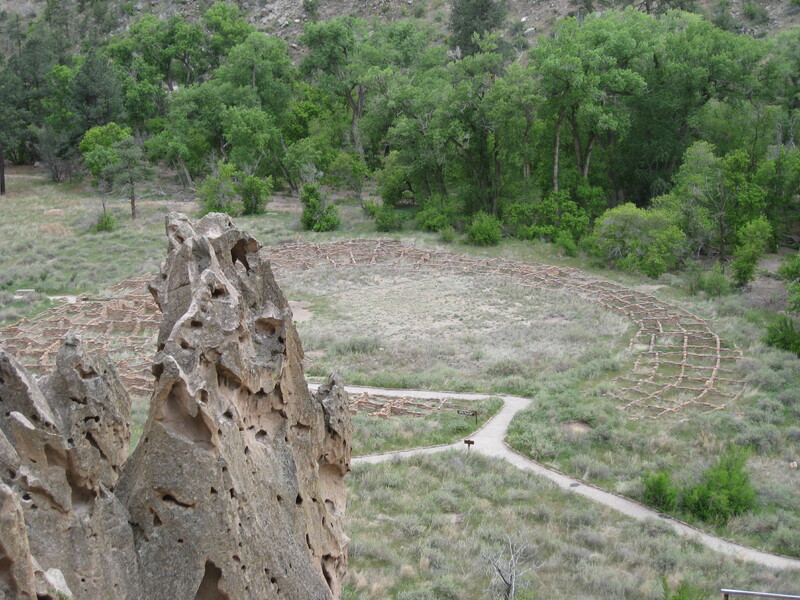 The week included an afternoon excursion to the Bandelier National Monument as well. We learned from the experts about: how to write a good pitch (or a bad pitch) for an article or feature story; how to conduct an effective interview; how to structure a story for a newspaper, magazine, or online media; how to write a simultaneously compelling and accurate science story; how to work with an editor and iteratively improve a story; how to deal with hype versus reality of popular and complex subjects; how to develop a successful book proposal and actually write the book; and more. I found it to be a helpful and stimulating workshop. This is just an example of many opportunities for exploring and learning science writing skills and for meeting and networking with other science writers and communicators. For example, much further north, in the upper end of the Rockies, there will be a science communication workshop in Banff, Alberta at the end of July. If you live in a major city or near a university, you can probably find local resources and events as well. (I attended inspiring talks by Lynne Friedmann in San Diego.) Moreover, although science writing has its unique tools and skills, it can be useful to explore opportunities for developing fiction writing or general reporting techniques too. It turns out that people follow a diverse variety of paths to become science writers and communicators. Some people begin as nonfiction writers or journalists and later realize that science is awesome and focus their energy on writing about scientists and scientific discoveries. Others are involved in technology or health-related fields and try to satisfy the demand for news and stories in these subjects. And some publicly engaged scientists (like Neil deGrasse Tyson) involved in outreach, education, or policy seek to expand or extend their efforts along these lines. Furthermore, keep in mind that there are proliferating ways to communicate science: with magazine and newspaper articles, online articles, blog posts, nonfiction and fiction books, children’s books, podcasts, videos, social media, and various combinations of these. If you are thinking about learning more or becoming more involved in science writing, I strongly suggest that you avail yourself of the resources of the National Association of Science Writers and the Council for the Advancement of Science Writing, and consider joining NASW especially if you’re based in the U.S. Their meetings are very useful, and they also organize activities and resources at American Association for the Advancement of Science (AAAS) meetings. Check out the World Federation of Science Journalists too. Depending on your field or beat, you also may be interested in the Society of Environmental Journalists or the Association of Health Care Journalists. To get started, I recommend pursuing any writing and communication opportunities you can find, however small. If you have your own blog or occasionally write guest posts for other blogs, continue with this and use it as a springboard to hone your skills and determine whether you enjoy it. If you are more confident about your voice or speaking skills, then look for opportunities to give public talks or to volunteer at a museum or library or zoo or planetarium. Many institutions develop online videos as well. If you prefer writing, your local newspaper or magazine could be a good place to start too. You could try working as an intern there or with public information officers at your local college or university. Needless to say, science writers write. I suggest checking out these compendia of resources: A Field Guide for Science Writers and the Science Writers’ Handbook. I’ve just begun to explore the annual anthologies, Best American Science Writing (with editors such as Alan Lightman and Rebecca Skloot) and Best American Science and Nature Writing (also with impressive editors like Elizabeth Kolbert and E. O. Wilson) too, and I recommend them. When you find science writers you like, follow them and read more of them, and try to figure out what they do that piques your interest. Stay open-minded, and you might find that they lead you in a variety of fruitful directions. Also take a look at these resources here (Ed Yong), here (Carl Zimmer), here, and here. Finally, if you have developed your skills and networks, consider trying your hand at freelance writing to see what it’s like. In addition, many universities offer one- or two-year graduate programs in science communication, writing, and journalism, and they may be a good investment of your time and effort. Rob Irion, the head of the UC Santa Cruz program, offers excellent advice about that, and if you are a scientist, read this article too. Whatever path you choose, I wish you good luck. The world needs more science communicators! ← Does your social circle bias your view of the world?